I can't believe spring break was more than a week ago. The last part of the semester is going to fly by! Last week was long and full, quite tiresome but worth it. I had a killer Masterworks test that left me without sleep as well as some late-night rehearsals for the scene I am directing. The final performance is tomorrow and I am hoping to have more pictures for you then :) It was interesting trying to get back into the swing of things post-Awaken, but 'twas a necessary evil. Friday night was my first Friday off all semester, isn't that crazy? So what did I do? 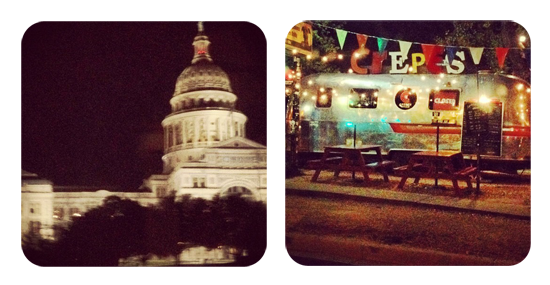 Road-tripped to Austin with Hannah and Claire of course. It has been a while since we've done something so spontaneous and the Three Musketeers needed to get out of town for a while. Hannah and I matched and I am so bummed we didn't get a picture. We were both in black and white striped shirts, skirts that buttoned down the front with a brown leather belt and ridiculous heels. It was too funny. Everything was closed by the time we got there, so we settled for dinner and coffee with a promise to return on Dia del Oso, our university's campus-wide holiday in April. I cannot wait! Here are a few sneak peeks at my scene. Hannah, Micah, and Kevin are fabulous. Truly. 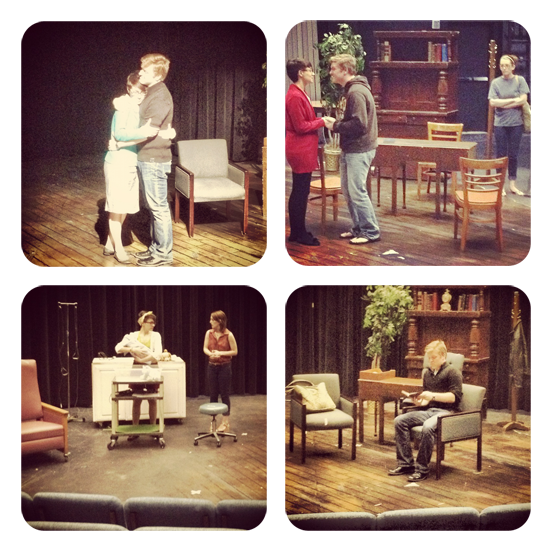 I couldn't have asked for a better cast and they are putting in such hard work! I am thrilled for the department to see the scene tomorrow. We add lights and sound tonight so we will see how that goes. Saturday night Claire and I had dinner with three of the freshmen girls and Grace at Cracker Barrel (always a favorite). Grace was highly amused by the bunny ears hat which flapped its ears and I think sang, too. Blythe and I realized our purses matched and of course had to document the event. 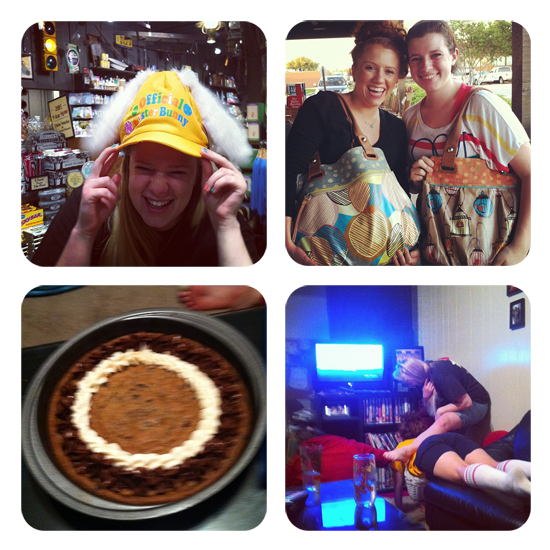 Once we finished dinner, we reconvened at my apartment for home-made cookie cake and to watch The Devil Wears Prada. I love each of these girls dearly and it was a fantastic night. There's a short update for you! Now off to finish a bit of homework before classes pick up. that homemade cookie cake looks amazing.